This is not the hardest puzzle in the world. But it's one of the most charming. 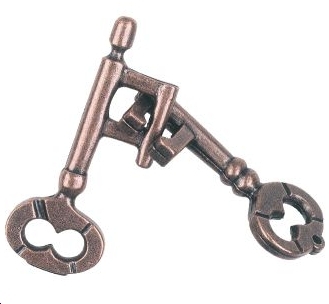 The object is to separate the two keys. 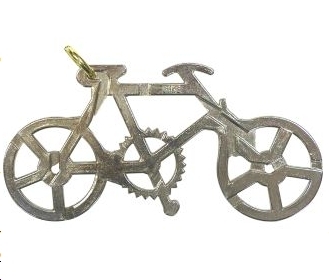 If you like the Cast Bike puzzle, you'll like this too. 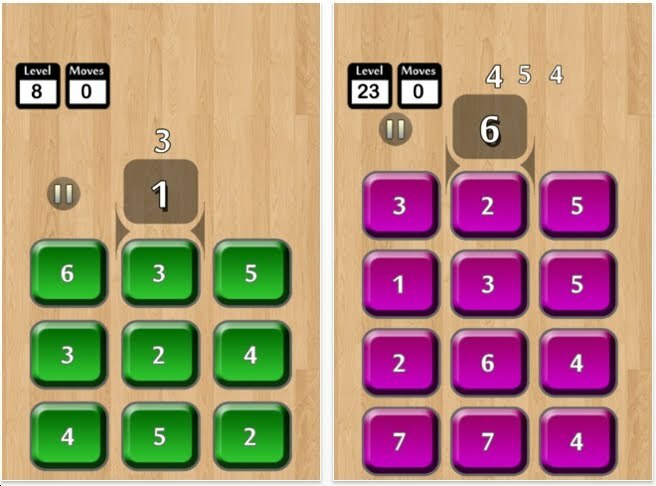 Eric Paquet recently contacted me about his new puzzle app: Perfect Tiling. It's his first puzzle app. The diagram above pretty much sums up what this puzzle is all about. Fit the pieces into the blue square above. There are 10 different grid layouts. One is a cross. Within each of those 10 grids there is an infinite number of puzzles. The puzzles are not easy to solve. Fortunately, you can get a hint in the form of 1 puzzle piece being placed in the correct position. I have solved 1 puzzle in each category. It's a bit like the recently reviewed Fish Crackers. If you like that, then definitely give Perfect Tiling a try. Pushpop is a solitaire version which is similar to Crazy Eights and Uno. Tap on any card at the top of a column. The next card must match the number or color. Try to get all the cards off the grid. Not terribly hard. Also, I'm pretty sure there are multiple solutions. This is good fun for kids. The object of Twin Beams: plant 2 trees in every park so that each row and column has exactly two trees. Also, two trees cannot be adjacent to each other – vertically, horizontally or diagonally. I've seen this type of puzzle before. 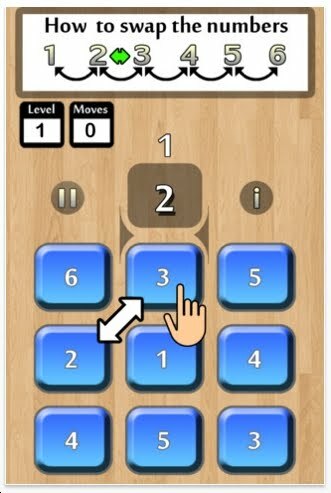 Most recently in '63 Logic Games' which is another puzzle app. They call that game Parks. 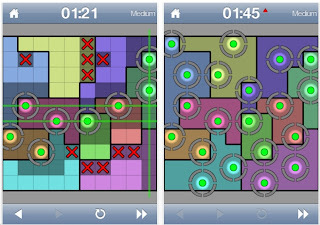 Nicola Salmoria contacted me recently about his new app Twin Beams with a really long explanation of everything: how much time he put into it, how he borrowed the concept etc. Bottom Line: there are 10,000 levels: 2500 at each level. The easy levels are easy. However, I couldn't stop playing them. My objective was to solve each in less than a minute. The addiction has set in, it's real. My newest goal is to solve each medium puzzle under 2 minutes - but I'm not quite there yet. 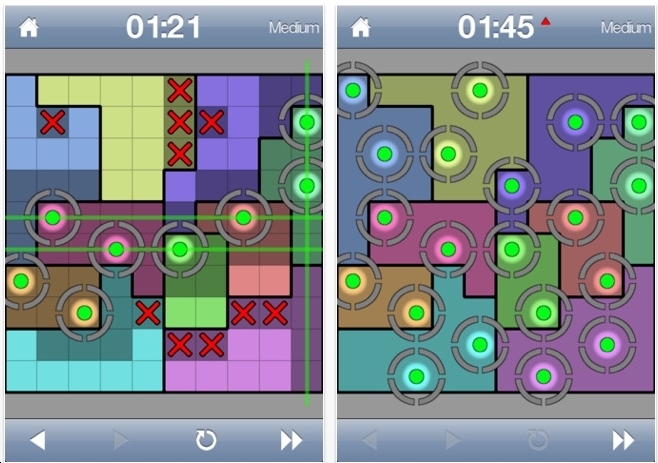 The one qualm I have with Twin Beams is that the user can skip a puzzle, but not return to it very easily. I think you have to cycle through the remaining 2500 at that difficulty level. Look at the Statistics! 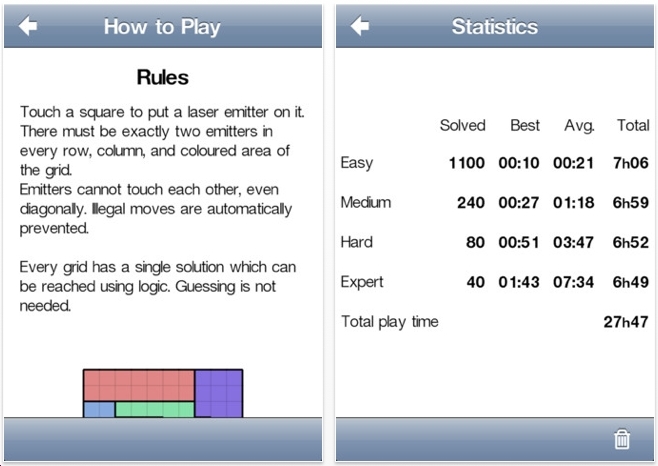 This is the first puzzle I've seen that records how much time the user has actually played the puzzle. Myself: I've played the puzzle for 9 hours and 41 minutes - so far. I expect to get at least another 50 hours of entertainment. Not bad for a couple of bucks. 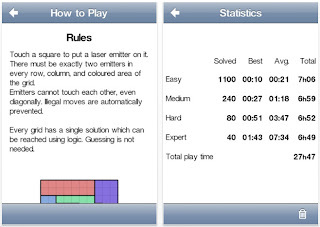 Twin Beams absolutely joins the list of Best Puzzle Apps of 2012. Cast Bike is part of the Hanayama collection. The object is to get the ring off the bike. In terms of difficulty, this one is pretty easy. But there is a certain element that is so appealing. I won't give it away. Also, the metal itself is really nice to have in the hands. If you don't have this, add it to your collection. I've lost count of the number of total ripoffs of Rush Hour. This is the worst. Why? Because it comes with just 27 levels. Skip this crap and look for Blockado. 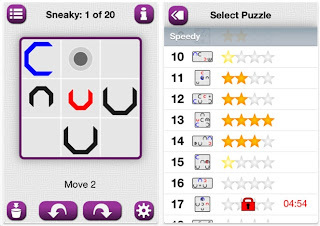 It's a set of 4 puzzle apps that have some clever innovations to the Rush Hour theme. I've written before about NineOut which is a point scoring puzzle app. I am now the all-time high scorer at 97,000 points. Oh yeah! I'll be famous. Some tiles are greater than 10 though! Double tap on them if they're even and they are divided by 2. 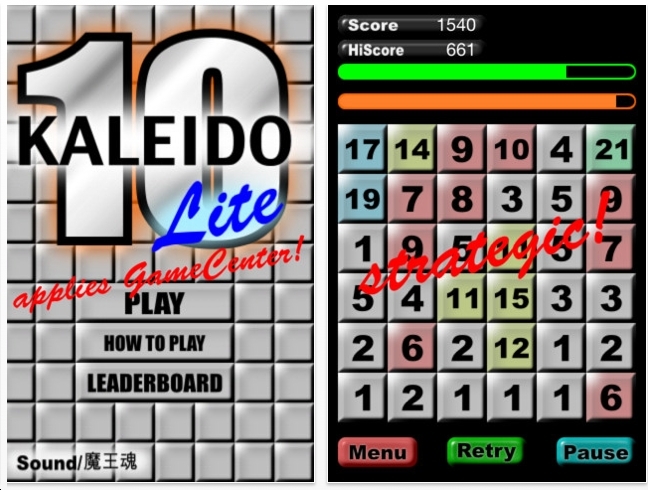 Kaleido 10 has the potential to be a really fun puzzle. 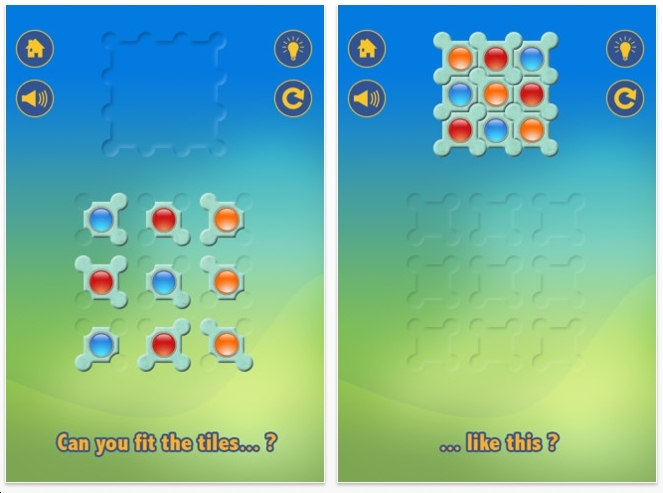 However, there are too many tiles greater than 10. A better game is NineOut. 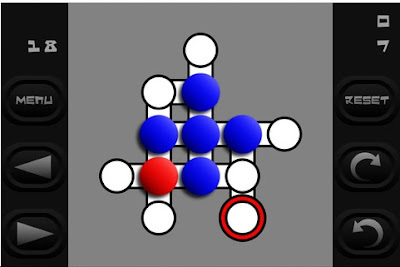 The object of Clickmazes Boxup is to push the red C into the blue C. Think of it as a kind of sokoban. Years ago I became a huge fan of Andrea Gilbert's website clickmazes.com. One of my favorite puzzles was Boxup. It only had 12 levels. But I'm sure I solved them several times each. 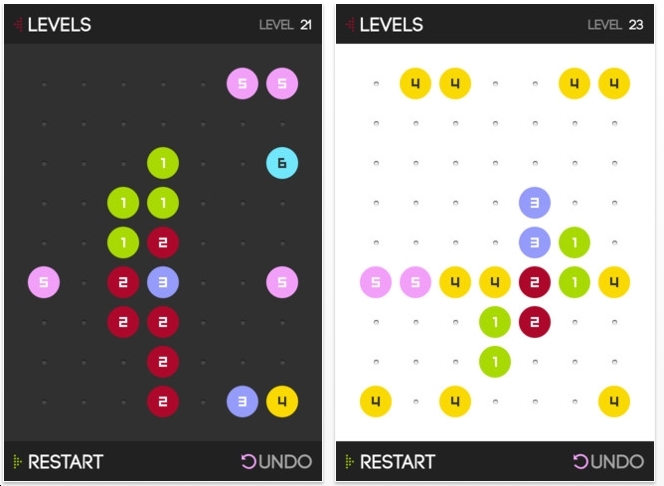 Now, finally, Boxup is available with 110 levels. They are classified as: Trainee, Speedy, Quirky, Sneaky, Nasty and Beastly. I have solved all of the Trainee to Nasty levels. Of the 20 Beastly levels, I've done 3 of them. This is excellent fun. Well worth the money. 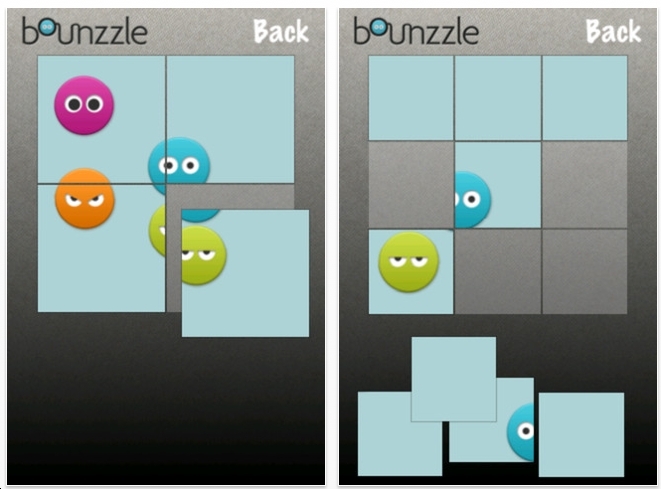 Clickmazes Boxup easily makes its way onto the List of Best Puzzle Apps of 2012. 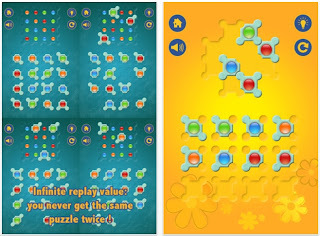 Fish Crackers is another puzzle app from the prolific Grabarchuk Family. The object is to assemble the tiles into each frame. 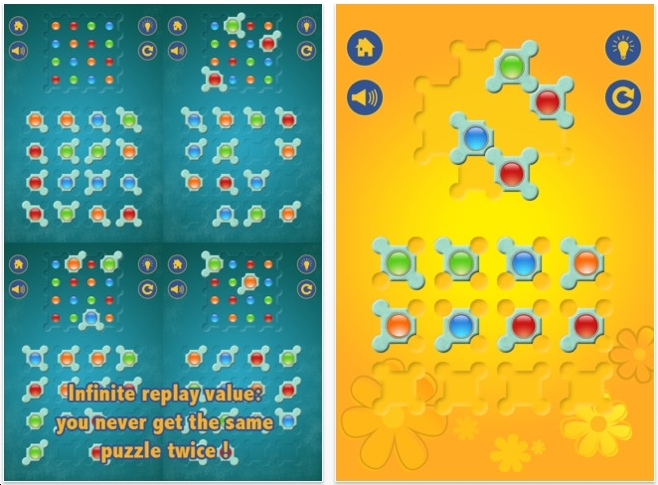 There are 100 puzzle levels. I have to admit: I'm not a big fan of these types of puzzles. Nevertheless, this is a fine set of puzzles. I know that my 7th & 8th grade students would like this. 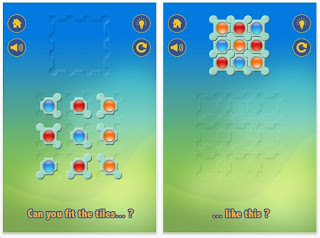 Without a doubt, you should also try their other puzzle Sliding Tiles. 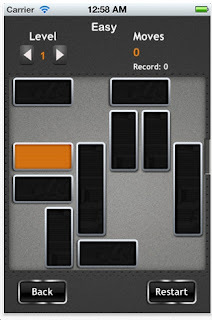 Strimko is another terrific puzzle app of theirs. 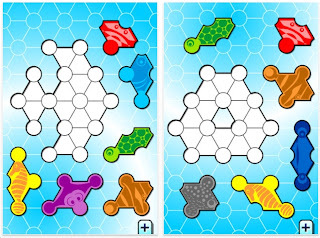 Cast Elk was one of many puzzles designed by Nob Yoshigahara. 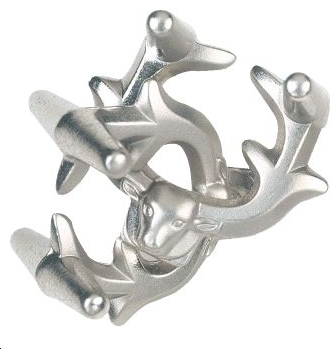 The object is to take the 2 antlers apart. When you solve it, it seems quite simple. Then try again a week later and it's not easy any more! Very inexpensive at $13. Click here for the solution. I knew Nob casually via the International Puzzle Party. He was quite a character. He performed a magic trick at one of our banquets. The trick involved giant cards placed in envelopes. He never touched anything. In the middle of the trick, he told me how simple the trick was. I don't think anybody figured it out. Cargo-Bot is a programming puzzle. 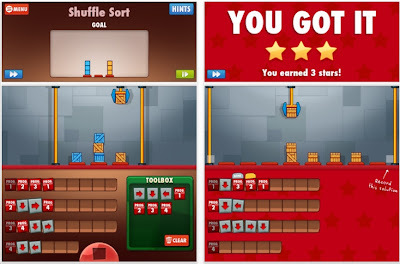 Your task is to pick up the colored crates and re-stack them. More than one of my 'followers' has pointed this out to me. I've solved 18 of the levels. My solutions were not efficient and I got mostly 1 star each time. I like Cargo-Bot, but I'm not feeling the addiction. 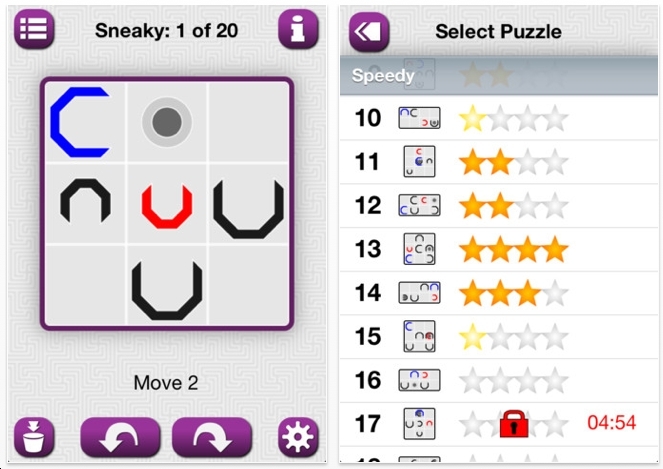 So many people have sent me emails saying how much they & their kids enjoyed Lab Mice Puzzles. Thank you! Click here to read about the Silver Award from Parents Choice. I have posted 2 or 3 entries about Tripevo. Today I set a new record for the highest score in Tripevo history at 3.3 million. If you break my record, I will send you a prize. 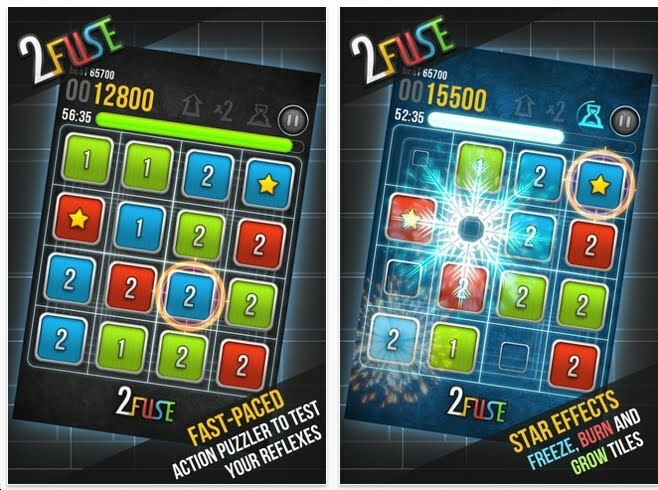 2Fuse is a point scoring app. You are given 60 seconds total. Tap on two red 1's and they turn into a single red 2. Then tap on two red 2's and turn them into a single red star. Then tap on two red stars. The blues are the same. Think fast, tap faster. Not a great puzzle app, but it's free and fun. 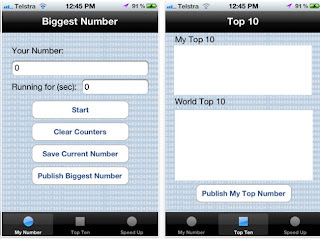 I don't know why, but Biggest Number is listed as a free 'puzzle' app. This app is beyond stupid. The object: click start and watch your score increase by 4 every two seconds. Just watch the number rise. And when you're totally bored (after 10 seconds or 3 days) post your number on Facebook. Oh yeah, you can buy the upgrade where your number will rise at 10 times the rate, or 100 times the rate or even 1000 times the rate. This could be the stupidest 'puzzle' app of all time. Bounzzle is a jigsaw puzzle where a ball is constantly bouncing/moving and you have to figure out where the pieces go. The grid size is always 4x4. I've done all 16 levels. It's good. And it's free. For my money, I'd also go with Jigglesaw which has different themes and bigger grid sizes. Click here for the solution. The original Cast Key is quite nice. This version is completely different. It's not hard, but it's good for guests, and non-puzzle friends. 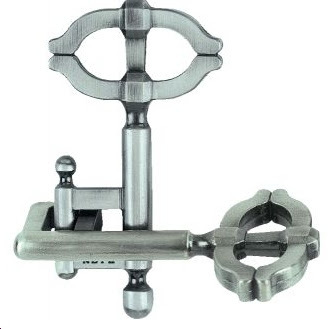 Reminder: these Hanayama puzzles are all inexpensive and very good quality. Buy multiple copies and give them as gifts. 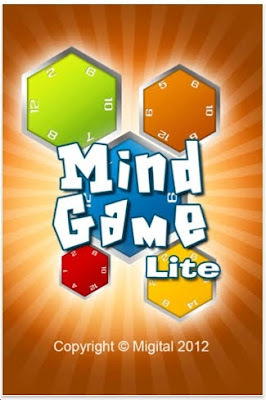 Mind Game is an edge matching game with hexagons. We've seen this type of puzzle many times in the past. This particular version is a bit skimpy on the graphics. If you're looking for a sleek mechanical version, check out Zoki. Not sure if they're still in business though. 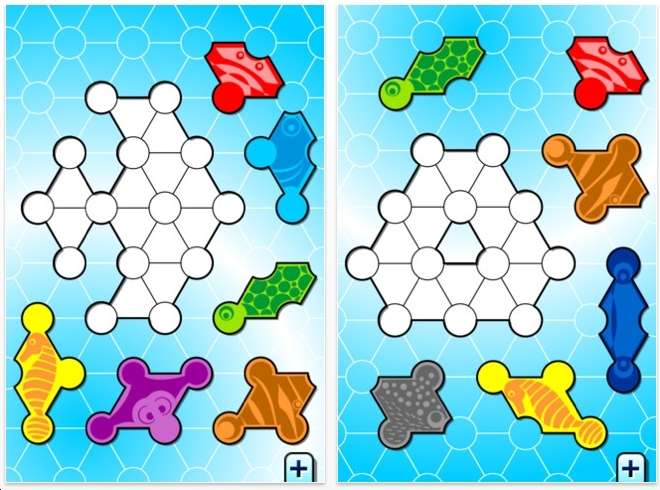 Also, check out Hexchange: a much better, very similar puzzle app. 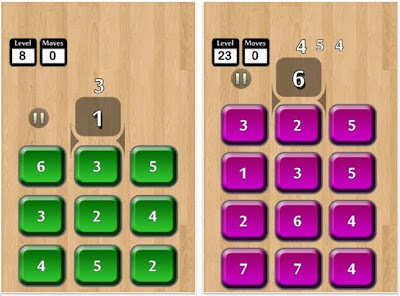 Numbercross is a free puzzle app fro the iphone, ipad. 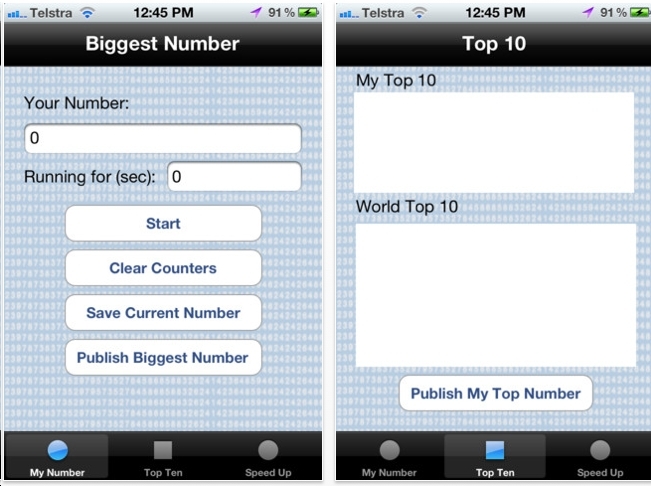 The goal is to get the correct number to the top of the grid. 1 can swap with 2. 2 can swap with 1 or 3. 3 can swap with 2 or 4. Get the idea? There are 38 levels. I've done them all. It's fun! Switch Candy is a Lights-Out type game. Try to get the whole board to be one color. Tapping on 1 cell switches that tile and the surrounding cells. We've seen this type of puzzle many times before. The graphics are okay. But I'm not feeling the addiction. 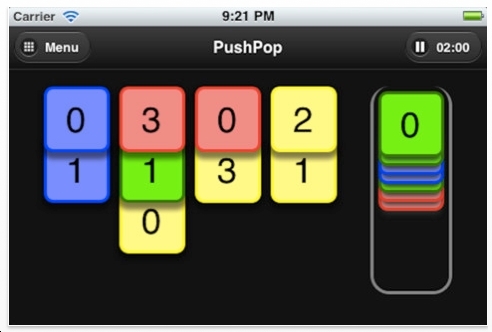 Ivan Vassilev recently contacted me about his new puzzle app Touch To Push. The object is to get the red circle to the red ring. How: touch on an empty cell, and all the colored tiles will slide away as far as possible. There are 400 levels. I did the first 50 and the last 50. 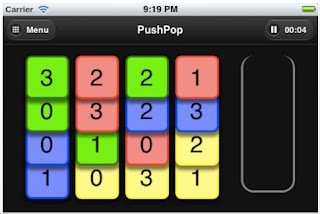 Touch To Push is a very respectable puzzle app, but I'm not feeling the addiction. I prefer Ivan's other puzzle app: tJam, which is almost a masterpiece. Click here for the solution. I first got this puzzle 7 or 8 years ago at the International Puzzle Party. It was designed by James Dalgety. The title was something different. Something like St. Mungo's Fish. At the time, I think I paid $30 or $35. 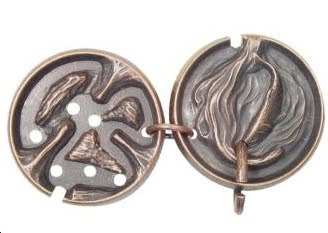 This version is cast by the great Hanayama puzzle company and costs about $13. Why did I pay so much!? 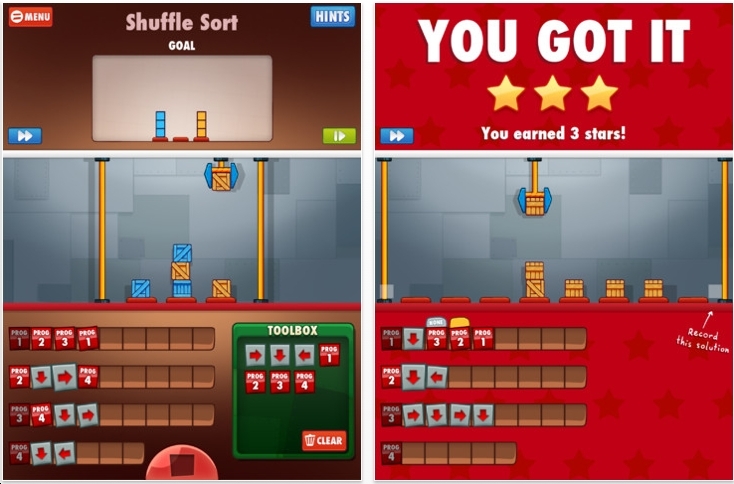 Scroll down a couple of weeks to see my review of Magic Bricks. I had gotten up to level 80 and then suddenly - all my progress was lost. Most of it anyway. 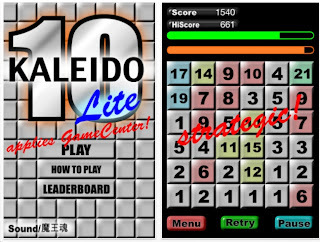 The program indicated that I had only solved 40 levels. Needless to say, I was shocked and outraged. I thought about writing to the developer to complain. Then I realized how sad and pathetic that would sound. Right now, everything seems to be okay. 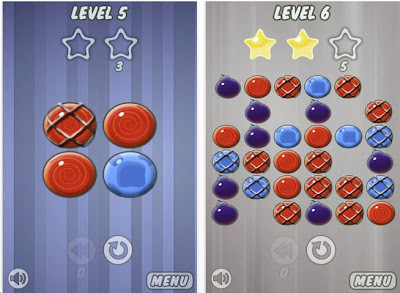 My progress has been mysteriously restored and I completed levels 96 & 97.